Want great deals on airfare to save money? Enter giveaway below to win 1 year subscription to Flight Canvas plus free $50 Paypal cash. Money Nomad has partnered with Flight Canvas to offer an awesome giveaway! 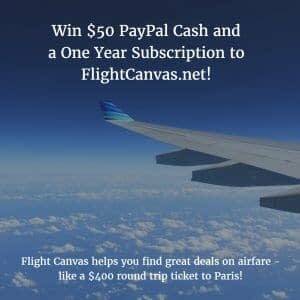 Enter below for a chance to win $50 in PayPal cash and a one year subscription to Flight Canvas – a service that shares the best round trip deals from the US to the rest of the world. Discover round trip flights for under $400 to Asia and Europe! Enter below and visit FlightCanvas.net before June 12 to receive a 1 month free trial. Giveaway is open to US. Ends on June 30, 2016. Disclaimer: Work Money Fun is not responsible for prize fulfillment. Sponsor(s) are responsible for awarding the prizes to the winner of $50 Paypal giveaway.